Attorney Brandon Leopoldus, who represented La Canada High School football player Drake Beasley Jr. at his Oct. 10 appeal hearing with the CIF State, was still in disbelief on Tuesday morning, a day after learning his client’s last attempt at eligibility was denied. Beasley, considered to be one of the top running backs in the state, was declared ineligible for the season by the CIF Southern Section in September after his transfer to La Canada was challenged by his previous school Loyola on grounds that there was undue influence. His appeal hearing was held on Oct. 10, at which time both Leopoldus and Beasley’s family felt confident the original decision would be overturned and the standout player with several college offers would get some semblance of a senior season. Instead, the CIF State appeal panel ruled in line with the Southern Section and now it’s very likely Beasley’s prep career is over. Reading from a letter provided to the family that explains the CIF State’s decision, Leopoldus said that the two infractions noted were Beasley’s family’s contact with La Canada coaches at a practice before he enrolled at the school, during which Leopoldus said that the family was directed to the administration offices, per guidance given to coaches when a potential transfer inquires about a sports program. The second revolves around contact that Beasley’s father, Drake Sr., had with the eventual landlord of the La Canada home that the family later moved into in order to establish residency in the district. The landlord, according to Leopoldus, has a son on the football team and is also La Canada’s team photographer, and CIF took issue with this. Beasley left Loyola in August after his family said they were unable to afford tuition, which they say was taken care of by the school for his first three years, but was not going to be covered for his senior year. Loyola later said that it informed the Beasley’s their financial concerns would be handled, something the Beasley’s deny ever happened. Not long after arriving at La Canada, Loyola said that it was going to challenge the transfer on grounds that it was because of undue influence and there were questions over the Beasley’s address change. It was the first time in 18 years that Loyola had challenged a transfer. Despite a long report compiled by an independent investigator hired by the La Canda Unified School District, the Southern Section found Beasley ineligible for the season. Without Beasley, La Canada is 4-4 entering Friday’s regular-season finale against San Marino. The Spartans are a longshot to make the playoffs. Leopoldus said he and Beasley’s family are considering their next step, if any. The only option at this point is to file a court injunction and hope to get CIF’s ruling overturned. But that may not come in time to salvage even one game’s worth of action for Beasley, who is allowed to practice with the team but not suit up on Friday nights. Share your thoughts about Week 8 … or anything else on your mind. 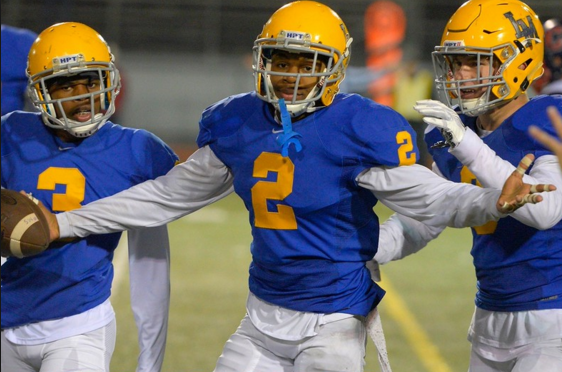 La Mirada senior defensive back Elijah Hicks, a four-star recruit, will spend his college playing days in South Bend. Hicks gave a verbal commit to Notre Dame on Tuesday night, thus ending an active recruiting process that saw him garner interest from many of the country’s top football programs. Hicks has 22 tackles and two interceptions this season. He’s also scored three touchdowns while on offense.